Three Good Rats: How Long 'Til Black Future Month? We're not going anywhere until we talk about this cover and title. I mean, come on. That amazing hair with those weird but cool adornments, the cool but self-confident look on the young woman's face, the necklace. The fact that she doesn't care we're here because she has other things to think about. 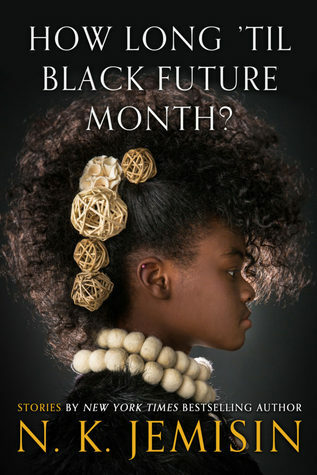 The moment I read this title in a review I told a coworker who instantly decided it will be the theme of our annual Black History Month display and now our display will be about Afro-futurism. Also, this is a collection of short stories by N.K. Jemisin and if you've been following along at home you'll know that I read the Broken Earth series late in 2018, all three books right in a row. This author is so imaginative and perfectly executes all her ideas, as she shows us in this collection. These stories range from AI taking on a life of its own to a mysterious restaurant that can re-create any meal you've had in your life down to the tiniest ingredients if you just tell them the date on which you ate it. There are a lot of stories in this collection, 22 I think. Some are set in the same, or similar, worlds but in general they're so different from each other. Which I guess is the thing about science fiction and fantasy. There's a story set in the Broken Earth world, and I think one set in the Dreamblood world, though I'm not sure as I haven't read that series (yet.) There was not a story that I disliked or even found meh. Ones that I remember vividly a few days after having finished the whole collection: "L'Alchimista," in which a mysterious stranger approaches a chef with a strange bundle of ingredients and recipe for her to make for him (it doesn't sound like much, but trust me). In "The Effluent Engine" a Haitian woman visits New Orleans to ask a particular man for help developing an engine to turn rum by-product into a power source, but finds his sister more helpful in the process and, not insignificantly, more attractive. "Valedictorian" takes place in an isolated place in which the top and bottom students are sent outside, never to return, and although everyone is afraid of going one student is still determined to be at the top of her class. In "Walking Awake" children are raised and used to be bodies for beings that change them out like outfits. I can't even adequately describe "The Trojan Girl." Short stories will probably never be as appealing to me as novels. Reading a collection can be jarring, switching from one to another just when you've gotten the lay of the land and figured out what's going on. Sometimes a short story is enough unto itself, and at other times I wish it were a whole novel. There were both kinds in this collection and I feel like I visited so many different worlds and people and people who were maybe not quite people. Speculative fiction is weird. But I do know one thing, which is that N.K. Jemisin is excellent at writing it.